If ever there was a sign of the growing appeal of life in the MLS, it was Saturday night in Montreal as former AC Milan and Italy defender Alessandro Nesta made his Impact debut against Thierry Henry’s New York Red Bulls. That is a combined eight league titles, three Champions League triumphs and 201 international caps, for those counting at home. Two big names with remarkable resumes locking horns in a key Eastern Conference battle was just about the perfect advert for the MLS. On this night, it was Montreal Impact and Nesta who delivered the sucker punch, scoring two quick goals at the start of the second half and going on to win 3-1, but seeing the two stars collide prompted a trip down memory lane, more than anything. Twelve years ago, Nesta and Henry went head-to-head in the Euro 2000 final, a night of huge drama and contrasting emotions. The Italian was part of a back three, alongside Fabio Cannavaro and Mark Iuliano, while the Frenchman lined up on the left of a three-pronged attack. What do they remember about that night? "Lifting the cup!" Henry said, with a smile. "That’s it." "We were very young and we had very tired legs," Nesta added, ruefully recalling the closing moments when Sylvain Wiltord netted a 94th minute equaliser for France, who then snatched a Golden Goal winner from David Trezeguet in extra-time as Italy ran out of gas and fell to a cruel defeat. Since 2000, Nesta and Henry have gone on to achieve much more in their careers (the former conquering Europe with AC Milan and winning the 2006 World Cup; the latter leaving a legacy at Arsenal then winning the Champions League and La Liga with Barcelona) but the mutual respect remains strong. "It’s really good for the league that he has come," Henry explained. "He’s a great guy and some people thought he was too old but he answered that tonight. He’s a chief. He can calm people down and pass the ball around." While he batted away other questions, he was only too happy to take the time to sing Nesta’s praises. Nesta, meanwhile, is less fluent in English but was clear on just how "very good" Henry is. 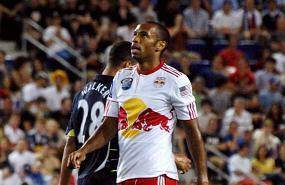 Though Henry spent much of Saturday night in a slightly deeper role for the Red Bulls, there were plenty of opportunities for the sellout crowd to see the two men battle. The Frenchman landed an early blow with a swift turn and cross that almost led to a New York opener, before Nesta made several timely challenges in an impressive partnership with fellow centre-back Nelson Rivas, formerly of Inter Milan. Henry would later find the net with a calm second half finish but the Impact had the last laugh as substitute Sanna Nyassi sealed the win late on. The Montreal players were not the only winners on Saturday night. MLS officials will have been grinning from ear to ear at the sight of another global star making his debut in North America, boosting the league’s ratings and fanbase. The sight of countless supporters camped outside the players’ car park waiting for a glimpse of Nesta, Marco Di Vaio and other Montreal Impact players showed just what a mark the sport has made in an ice hockey-dominated city. Meanwhile, the Red Bulls’ £1M signing of former Everton midfielder Tim Cahill – who travelled with the squad and looked ready for action – is another thumbs up for the league. Cahill, 32, has plenty left to offer and will provide a valuable injection of energy in the final months of the season with his box-to-box style of play. All this is good news for the future of the MLS – and, indirectly, for the United States national team, who will benefit as the standard of play improves. With more big names likely to be lured across the pond, more special nights lie ahead, pitting legend against legend and conjuring more memories of the sport’s biggest stages.